Editor’s Note: The following article is a sponsored editorial submission and is written by the sponsor, not LPM editorial staff. We’ve spoken with retailers from around the world, some of whom are literally reporting hundreds of thousands of theft incidents a year. They do their best to connect the dots and build cases in an attempt to keep these unwanted “shoppers” out of their stores. But the consensus is that it is time-consuming and harder than it needs to be. We’ve spent the last five years working on solving this problem. We’ve learned a lot through trial and error in partnership with our pioneering customers. In the last 12 months, they’ve reduced loss by an average of 20 percent and told us reporting crime, and stopping prolific offenders from targeting their stores, has never been easier. 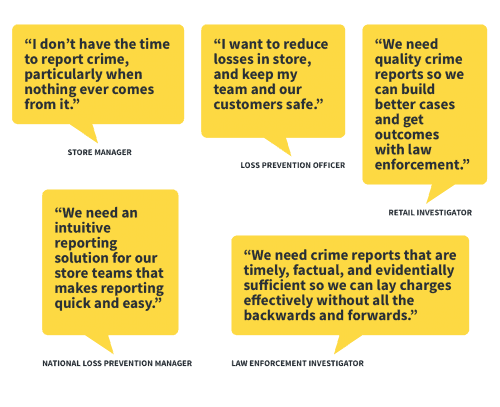 This post covers the journey we’ve gone on reimagining how reporting retail crime should work so that store teams, support offices, and law enforcement can collaborate and connect the dots easily. The ultimate goal is to stop crime in stores because reporting crime without outcomes is just another cost of doing business. Our goal is to design a crime reporting process that is simple, intuitive, and dynamic to capture the right information easily. We believe that it’s not just about designing a beautiful reporting form, but that the intel captured from the crime reporting processs serves as the beginning step in solving and preventing further crime. At Auror, our ethos is that using software today shouldn’t require training. Think about Facebook, with over two billion users who have never required training. If someone needs training to complete a crime report, then that is a failing of the crime report form, not the person reporting the crime. Over the last five years, we’ve had thousands of conversations with retailers and police about how we can make retail crime reporting easier. 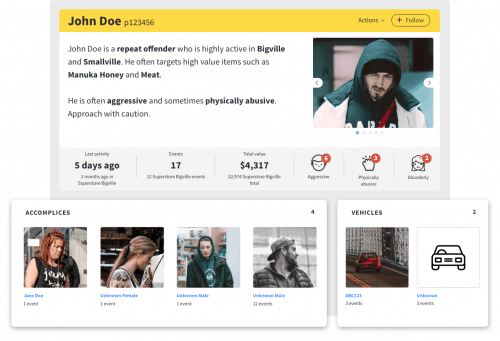 We’ve also spent hundreds of hours watching people report crimes in various ways, including in our current platform. From this process, we identified ten key challenges in the crime reporting process to solve for. These are what we consider to be the three most significant challenges to helping retailers stop crime in their stores. 1. Make the reporting process easy and flexible. Store teams are busy, so capturing info needs to be fast. In our research, we observed how busy store teams are and how many tasks they juggle running a store. User experience research has shown drop-downs and lengthy free text fields slow users down significantly. A shift to large, clickable buttons wherever possible makes completing an event report faster on both mobile phones and desktop computers. Users should also know how far through a crime report they are and be able to navigate between sections easily. Accessible buttons that meet the 9 mm minimum finger pad size. 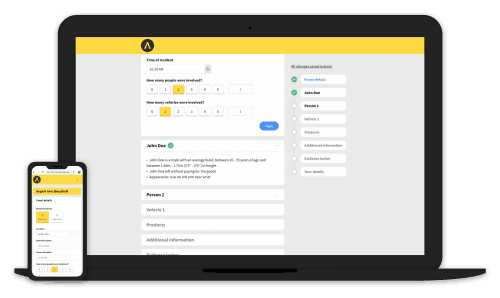 Along with best-practice form design where button groups are implemented for six or more options. Accurately capture data in a structured way. Smart forms with big buttons and dynamic fields are not only easier for store teams, they also help to capture structured data. This greatly increases investigators’ ability to connect the dots on repeat offending and organized retail crime quickly. We believe another important area for capturing structured data is a section about what products have been stolen. Entering multiple products in an event report can be particularly time consuming. One approach to this challenge is to maintain a set of relevant product categories for different retailers and automatically return relevant results as the reporter types. Capturing product at a SKU level and product category level also enables better reporting on high-risk products categories, which can drive identification of organized crime syndicates targeting particular hot products. We’ve noticed teams using mobile devices on the shop floor as well as computers in the office when reviewing video footage. The user interface needs to work equally well on different devices. Store teams are often pulled away from reporting the crime by another urgent task. It feels important for the event report to progressively save a draft during completion. Elegant, responsive designs to allow users to keep track with reporting events and not lose changes along the way. 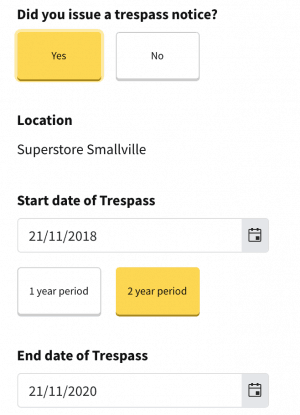 Reporting a retail crime event and then completing a separate trespass notice adds unnecessary friction. Capturing trespass information while reporting a crime makes this quicker and easier. 2. Identify repeat offenders and ORC groups across isolated events. Our data shows that 10 percent of offenders are responsible for 45 percent of the retail crimes reported, and we expect this figure to grow as we continue to find smarter ways of connecting the dots. Linking the people committing crime to all the individual events they’ve been involved in quickly helps store teams identify the people they need to watch out for, helps investigators know where to focus, and allows police focus on the heavy hitters. Search descriptors to identify known people. As loss prevention professionals know, professional shoplifters are often involved in multiple events. Investigators frequently build cases linking individual events together. Individual events often involve multiple accomplices, so the case grows in complexity. We need to make it easy for investigators to connect the dots and navigate among those individuals involved in the events and the events themselves. Examples of this include using vehicle registration data to automatically link instances of the same vehicle being used in multiple crimes. This can help link people who are using the same vehicle. 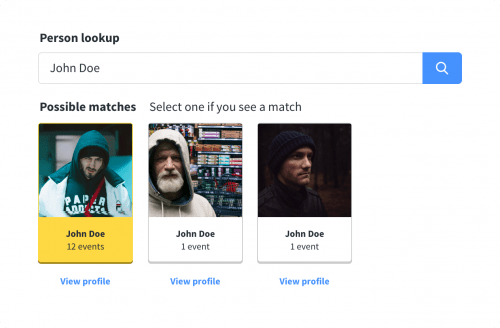 Another option is to link accomplices where multiple people are involved in the same event, which can help investigators start building out the networks of crime groups. 3. Enable collaboration among store teams, support offices, and law enforcement to reach better outcomes. Collaboration is essential when reporting, solving, and preventing crime. Interactions need to be easy. As investigations evolve, so should the crime report. Reporting crimes in your stores, without outcomes, is just another cost to your business. It’s time to change this. Tell Auror your views on how retail crime reporting can be improved.